Congratulations to the winners of the autographed, first editions of Saving CeeCee Honeycutt by Beth Hoffman. The books are going to Hesper F. of Janesville, WI and Rory K. from Bayport, MN. I wish I had three hundred copies to give away, because I wish you could all read this book. I'm giving away books by Tami Hoag and Laura Lippman this week. Deeper Than the Dead is Tami Hoag's latest suspense novel, a book that takes us back to 1985, to the early days of the FBI's Behavioral Sciences Unit. It's top-notch intrigue, with two strong lead characters. 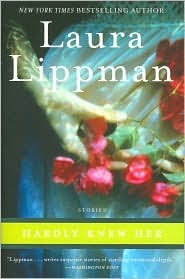 Or you could win an ARC of Laura Lippman's Hardly Knew Her, a collection of stories. "For the first time together in one volume, a mix of award-winning short stories," and a novella featuring Baltimore P.I. Tess Monaghan. So, do you want to win Deeper Than the Dead or Hardly Knew Her? You can enter to win both, but I need separate entries for each. If you'd like to win one, email me at Email me!. If that link doesn't work for you, the email address is: lholstine@yahoo.com. Your subject line should read either, Win "Deeper Than the Dead" or Win "Hardly Knew Her." Your message should include your mailing address. Entrants only in the U.S., please. The contest will end Thursday, Jan. 21 at 6 p.m. MT. Jim will draw the winners at that time. The winners will be notified, and the books will go out in the mail on Friday. Good luck! I've read Hoag's Dark Paradise and really enjoyed it. She's a good writer. Thanks, Kat. And, I read Deeper Than the Dead, and enjoyed it. Someone will be a lucky winner. 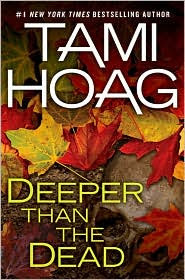 If you like Tami Hoag, you'll LOVE Deeper Than the Dead. I just read it a few days ago! The whole time I was reading it, I hoped it would never end. I really loved all the characters and would love to see the kids come back in another book. I would love to read Deeper Than the Dead. I hope you sent me your name and mailing address. It goes to lholstine@yahoo.com. Thanks! You're welcome, Camper223. I hope you sent your mailing address to me at lholstine@yahoo.com. Thanks! I'm late to the Hoag party, but better late than never! Just devoured Ashes to Ashes and Dust to Dust, and am starting on Prior Bad Acts. Thanks for the opportunity to possibly add another to my collection. I never heard of this author or book. apmonkey1 and John Ferris, I hope you both sent me entries at lholstine@yahoo.com. Jim will be picking the winners tonight.